March 2014 saw the Australian Defence Forces put on a spectacular display of military aviation to celebrate 100 years at the RAAF Centenary of Military Aviation Air Show held at RAAF Point Cook, the birthplace of the Australian Flying Corps and the Royal Australian Air Force. Showcasing Australian military aviation since its birth in 1914 to the present, the Point Cook air show presented a huge range of RAAF and other armed services aircraft and equipment both on the ground and in the air. With an assortment of aircraft ranging from our earliest, the Bristol BoxKite to the latest, the Lockheed Martin F35 Lightning II (ironically, both of which were replicas!) the show presented a wonderful variety of aircraft that have served with our armed forces. The show also provided the public with some wonderful opportunities to get close to many rare aircraft such as the Lockheed Hudson and Consolidated Catalina as they taxied closely past the crowds. The air show was not only a great recruiting opportunity for the Royal Australian Air Force, as a great deal of interest was also shown in the Australian Air League by a number of those attending. From amid the myriad of promotional stands in the main marquee, the League hosted a small display where cadets and officers from a number of squadrons tested the paper plane flying skills of visiting parents and children, assisted budding modellers with balsa glider making whilst also answering lots of questions about the League and its activities. And the interest was not restricted to just our promotional display as several families and a couple of TV news crews commented or enquired about our cadets as they checked out the static aircraft displays. 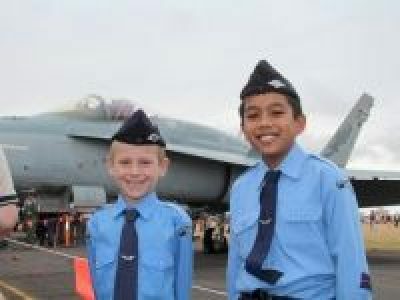 Certainly, the 2014 RAAF Centenary of Military Aviation Air Show has been a great success for both our hosts, the Royal Australian Air Force but hopefully too, the Australian Air League.